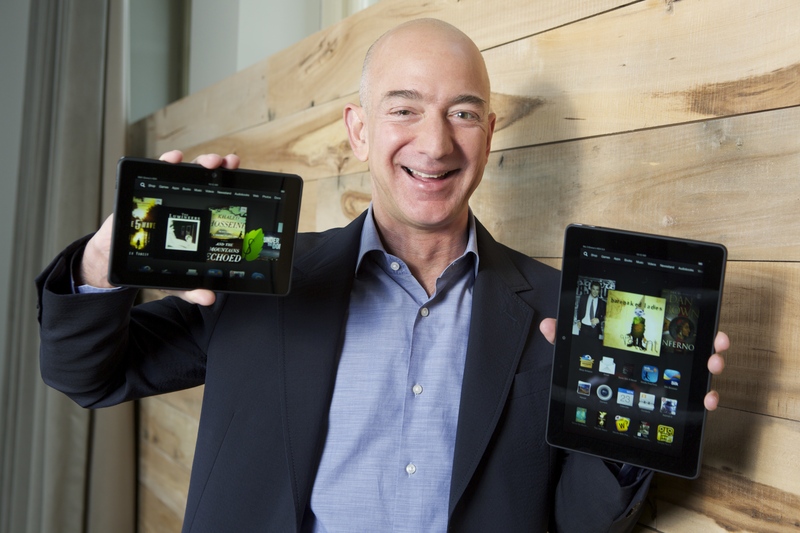 Yesterday, Amazon announced its new lineup of Kindle Fire tablets. In addition to upgrading last year’s 7″ Kindle Fire and lowering its introductory price to $139, Amazon unveiled the Kindle Fire HDX, which has a higher pixel density rate than Apple’s iPad – making for an ultra-high definition viewing experience. The 16 GB, Wi-Fi model with special offers costs $229 for the 7″ version, and the most expensive 8.9″ model – with a 64 GB hard drive and an optional 4G connection – will set you back $579. As you’ll see from the features below, the Kindle Fire HDX is significantly lighter than its predecessor and it has an exciting new feature called the “Mayday” button. This feature provides you with on-screen support, whenever you want, from a Kindle Support representative. And while you can see the rep and he or she can remotely access your device with your permission, the representative can’t see you – so no need to worry if you’re hair is sticking up and you’re still in your bathrobe while you’re being helped. Below is a letter from Amazon CEO, Jeff Bezos, that was posted to Amazon’s website the day of the announcement, as well as a video highlighting the “Mayday” feature. And stay tuned for my review of the device in the coming months. 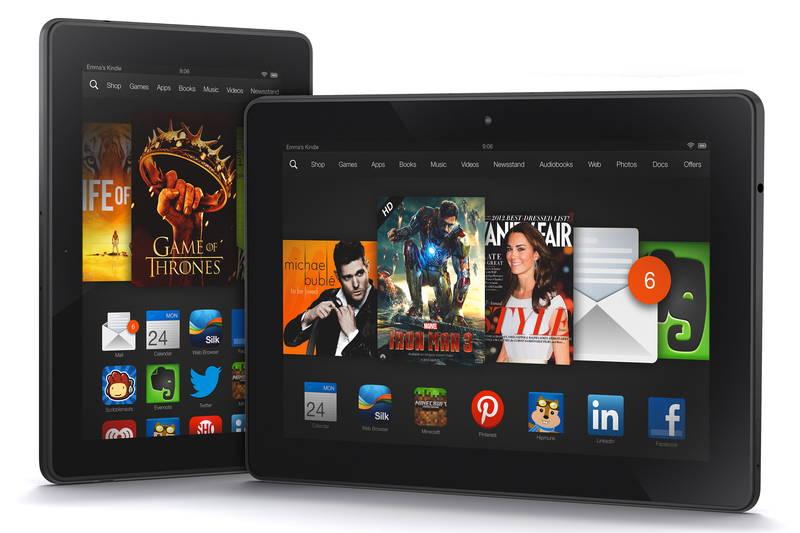 It’s been just two years since we introduced Kindle Fire, and the team is innovating at unbelievable speed. Today, I’m excited to introduce you to the all-new Kindle Fire family. These are powerhouse tablets. We added the latest graphics engine, doubled the memory, and tripled the processing power with the most advanced 2.2 GHz quad-core processor. Our HDX displays bring together exceptional pixel density (up to 339 ppi), perfect 100% sRGB color accuracy, improved brightness, and dynamic image contrast. You also get up to 11 hours of battery life—17 hours when you’re reading. Even the largest new Kindle Fire—the 8.9″—is startlingly light. We re-imagined our design from scratch, with a new magnesium unibody and molded glass-nylon alloy. At just 13.2 ounces, it’s 34% lighter than the previous generation. Kindle Fire HDX is packed with hundreds of updates, including new email, calendar, and productivity apps, X-Ray for Music, Second Screen, and—in addition to streaming—you can now download Prime Instant Videos and watch them offline. indle Fire HDX also introduces the revolutionary new “Mayday” button. With a single tap, an Amazon expert will appear on your Fire HDX and can co-pilot you through any feature by drawing on your screen, walking you through how to do something yourself, or doing it for you—whatever works best. Mayday is available 24×7, 365 days a year, and it’s free. check out our upcoming TV commercials. In addition to all the above, we’re taking another step forward in our mission to make it possible for anyone to afford a Kindle Fire. The all-new Kindle Fire HD has the same display quality and processing speed of last year’s high-end models and comes in at the breakthrough price point of only $139. We’ve worked hard to pack this much hardware, innovation, and customer obsession into these devices. We hope you enjoy the new Kindle Fires. P.S. Our industrial design team has invented what I think are the most ingenious covers—you can learn more about the new Origami covers here.